Choir kids will relate: our beloved music teacher from high school is battling cancer, and we wanted to show our support. She wasn’t up for lots of visits, so we pulled together to create a video of us singing one of her favourite songs: “Seasons of Love” from Rent. It was a simple gesture, but one we hoped would cheer and comfort a person who’s impacted so many. 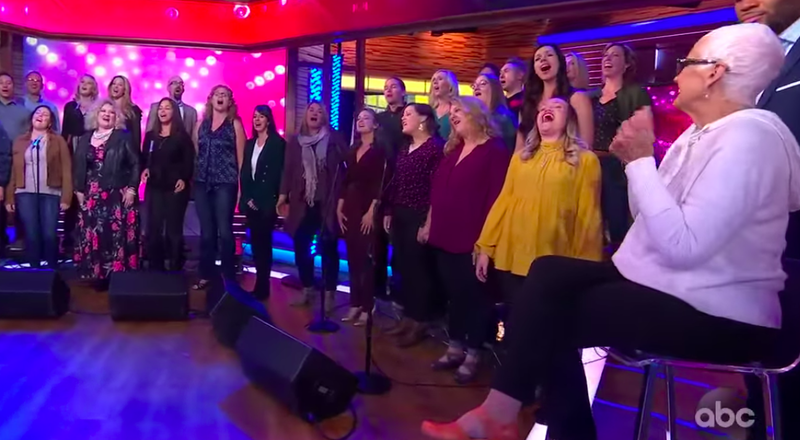 Turns out, not only choir kids can relate: shortly after sharing it with the school district (who shared it on Facebook), Good Morning America featured us on their website. Next, the story got picked up by Ashton Kutcher’s media company, A Plus. Then, the local National Public Radio station did a piece on us. After that, the newspaper printed an article. The story gained so much traction that Good Morning America decided to feature it on their national broadcast. They flew Mama Lu, as we affectionately refer her, out to New York for an interview. More than 40 of Mama Lu’s former students also made it to NYC (most paying their own way), and surprised her on set, along with original Rent stars Tracie Thoms and Anthony Rapp, who traveled from England and LA to be there. The video clip of the performance, posted online, has almost 400,000 views already, and hundreds of touching comments. Mama Lu has been interviewed for each of these stories, and continues to emphasize how touched she is that we took time from our personal lives for her. Fellow educators will not be surprised to hear that Mama Lu gave countless weekends, evenings, and weekend evenings to us – rehearsing, performing, and making music together. Time from our personal lives? This is nothing compared to what she invested in her students over the course of a dedicated career. Every child should have the opportunity to learn from educators whose positive impact sticks with them for years. A reminder that what you do, as educators, matters. For a little feel-good boost today, enjoy this uplifting, suitable-for-work story. What makes an educator influential? This entry was posted in Emily Meadows and tagged influence, music, the arts. Bookmark the permalink.